The following is based on a telephone interview with Emma Webster on 19th October 2017. Letham is a small village in Fife, close to Perth and Dundee and about an hour’s drive to Edinburgh; the population is about 150. About nine years ago, me and my brother- and sister-in-law started talking about how to make better use of our beautiful village hall. We wanted to extend the range of events from things like coffee mornings, whist drives, Valentine’s discos, and ceilidhs to something a bit different. Our wee team of organisers spent our teenage years in the 1970s listening to John Peel and going to live gigs in small venues. It was said about John Peel that he gave people what they didn’t know they wanted. In this spirit, we were convinced that if we offered something different in our fantastic village hall, we could draw in a new audience and surprise people. At the same time we would be bringing high quality entertainment to our own doorstep as well as helping the hall to flourish and providing a stage for local talent. We had a few contacts in the industry so we just … started! But in reality we had no idea it would take off the way it did. Almost overnight, musicians started to get in contact from all over the world who wanted to play. While our emphasis is still on local talent as far as possible, we have put on people from the United States, Australia, and Canada, as well as Manchester, London, and, of course, Edinburgh. Our raison d’être is to support musicians and we’ve built up a good reputation as a promoter over the years. Musicians who play for us always say things like ‘Such and such would really love it here’, and so we’ve built a great network through these personal connections. One of the ways we support musicians is by offering them a basic guarantee of £600 for a band. Other venues work on a door split or even expect the musician to play for nothing; venues don’t seem to be very artist-friendly unless there’s a big fee involved. As well as a decent wage, then, we also offer a warm, welcoming atmosphere and an audience who listen. The musicians stay in our houses after the gig—unless they’re local and can drive home—so non-local musicians don’t have to worry about accommodation costs or getting fed. We put on nine gigs in the first year, which was really tough from an organisational point of view, but also when trying to get a decent audience to come along. We all have full-time jobs so this is all entirely voluntary. I’m a deputy head teacher in a secondary school and while I would love to do this full-time, I know I couldn’t make it worth financially. So now we do six every year – and yet we get contacted almost every week by musicians wanting to play. Even six gigs is still a lot of work. I put in about 6 -10 hours per gig planning, communicating and promoting – mostly evenings and weekends. I do things like negotiating with artists, poster design, writing the blog, and looking after the Facebook page. On the night of a show, sometimes you’re up until 1 or 2am; you lose your Saturday … from love of music! The next day is all about the clean-up, so things like getting the PA system back in storage at the farmhouse up the road. The hall doesn’t have its own PA system so we bought one from our old sound engineers. The more popular we get, though, the higher the quality of the acts and the more requirements they have, so we are having to rethink that now. We have a really great sound engineer, though, which means that what the artists play comes out of the speakers in the best way it can. Tickets are usually £12 a head so we need at least 50 people to get the guarantee and a few more to cover costs. The hall costs £75 to hire and we pay £100 for the sound engineer, so that’s a minimum of 60-70 people to be comfortable. We also run a bar but we don’t make a lot of money from this. We use a local supplier to support local business but also because he does sale-or-return unlike the supermarkets. He sells the drinks to us at wholesale prices but we don’t add a big mark-up. It can be really nerve-wracking in the week before the gig when you’ve only sold 35 tickets and you’re thinking, ‘Why the hell are the tickets not flying off the shelves? !’ The only time we have a guaranteed audience is when we put on one of our favourite bands from Dundee, Sinderins. Then we sell out in no time! For our fiftieth show we put on King Creosote, who is from Fife. We deliberately didn’t tell people who it was going to be, other than that it began with a K, but we knew that the word would get out and it sold out too. Those kind of gigs are the financial cushion for the rest of the year and help us to keep enough money in the kitty in case no-one turns up. We have a network of other independent live music venues and house concerts with whom we often share suggestions of artists and who also promote us. There is no competition involved. We want to see a change to the model of live music that seems to be far too focused on the same elitist model of success as other types of entertainment such as football. It would be nice to think we could have an influence on developing a different, more widespread community approach to the arts that was actually sustainable and wasn’t based quite so much on a tiny minority of very famous stars playing huge soulless venues, a model which is of course a dead end for so many very talented people. We now have another group of volunteers running a new community cinema, Letham Lights, and we are collaborating closely with them. They were inspired to begin by the success of Letham Nights. We intend to keep expanding further with a bit of drama, comedy nights, workshops, and training in event management. It needs others to get involved because all the organisation is voluntary and we have a limited capacity but all it needs is a bit of imagination and the will to make it work. It is a constant struggle to keep everyone keen as most of the work keeps on coming back to the three of us and people willing to volunteer are not very reliable or numerous! There are not many live music venues about and yet musicians are just desperate to be heard, to get their music out there. It doesn’t always have to be about ‘making it to the top’. Some musicians just want to make a living and there is so much talent right under our noses locally that it is a great waste that they cannot make a decent living from their art and often end up giving up. As well as being committed to the music, we’re all committed to environmental sustainability. The village hall wasn’t very energy efficient when we first started, and our aim was to combine our love of music with the ambition of creating a zero-carbon hall. 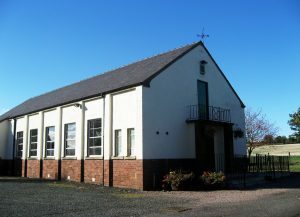 It was tricky at first, getting all local hall committee on board with this idea but the new secretary of the village hall is a great fundraiser and we support him by sending in letters of support when he applies for funding for a new boiler or for new windows. We have also made some financial contribution for certain grant applications which require matched funding. These incremental changes have already changed the efficiency of the hall, and made it cheaper to run, which has helped. The hall committee now understand that what we’re trying to do is a “Good Thing”. At the gigs themselves, most of the audience are fairly local which reduces our carbon footprint, we use LED lights, recycle all bottles, the bar promotes local produce, and, when we introduce the musicians, we encourage the audience to use public transport where possible. The musicians talk about it as well, so it becomes a ‘thing’ that people recognise. The gigs become educational in that sense, and we try to promote no cost and low cost sustainability measures. Lots of musicians and our audiences are definitely attracted by our ethos. My advice to anyone wanting to do something like this is to just start. The key thing is that artists need to get paid for what they do. We’ve had a few acts who are all about ego, but most put their heart and soul into performing their music, so we feel duty-bound to pay them. We were motivated by a shared love of music and even though I’m not a musician myself, I get to stand up and introduce the musicians on stage, so I get to feel a whole sense of being part of the music community. It also feels like we’re making a bit of difference about the whole climate change issue, while really enjoying connecting with music.